Mountaineering nowadays became one of the options to many to complete their bucket list or a must-travel list before we reached the final peak of life. Some other says, they climb mountains to enhance their physique, but some are also for emotional thing as they get along embracing the nature. At this present time, climbing a mountain is not just for personal matter, but it can lead a way where we share and reach other communities that were left behind. Thus, it became a platform in helping other people by sharing either services or in kind. In the most precious moment that a mountaineer has reached the peak of the cone, it gives them a wonderful experience to reach the top of the mountain but that does not end with that until this happens. 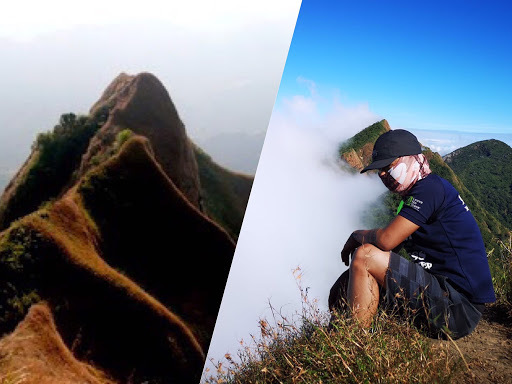 Recently, a viral Facebook post from has surfaced in social media and mainstream television regarding a group of mountaineers who climbed the Tirad Peak in Gregorio Del Pilar, Province of Ilocos Sur. Everyone from their group are all excited to reach the peak, but on their way, an unexpected tragedy happened upon reaching the unforgettable peak. The group were shocked and panicked as unexpectedly, a mishap happened when one of their colleagues accidentally fell-off from the peak that caused the final climb of his life. Gloom started to creep in as soon as we reached the path called The Lonely Trail. It was one o'clock in the morning when we started the trek going to Tirad Peak. The Lonely Trail and its claimed story from a long time ago left a pinch of sadness in my heart. We were sleepy still just trudging forward, letting time pass us through so that when we get to the summit, we will have a glorious view of the sunrise and bathe on the innocence of its first rays. We got to the peak on time for the coveted early morning light. We were so jolly. We had happy hearts. All we wanted to do was to get to that top most monolith so we could have a 360 degrees view of the world to see. And it is every climber's goal to reach the peak. Who wouldn't? So there we were. We had to do it by batch since the monolith platform is pretty narrow as explained to us. It is only enough for 4-5 persons. Also, the wind could be a little challenging up there. So just a few people were allowed to go. We all heard "plagadag" of a falling thing and the rumbling and then screaming of people from up there. We saw him fell...with shock on our faces, mouths open in disbelief. All blood drained from our faces. Terror came next. We were rattling in fear. I pulled out a stick of Marlboro, lighted and sipped the smoke in and out fast. I didn't know how or what to feel at that moment. I was still trying to process what happened. Never in my entire years climbing mountains did this happen to me. I was there smoking trying to calm. While I hear everybody distinctly saying prayers to heavens above. And then rationality started to sink in so gradually. We had to move and do the most logical actions to keep everyone safe. The rest of us were aborted to climb the monolith. We had the rest of the team go down and back to the camp site. I was left with two of my teammates, Mackoy and Maja, with a local guide to wait for the rescuers. We called multiple people. We called endlessly for help. We were desperate so much that we asked the guide to permit us to go down and check the body. But we were not allowed to descend down the cliff to ensure our safety and prevent further accidents that may happen to us if we insist. We tried to have WISAR arrange a chopper for us. We understood it would take a little long. We waited patiently. We constantly shouted "sir jeff! sir jeff! stay with us please! Malapit na ang rescuers sir! Kukunin ka namin jan! Uuwi tayong kompleto sir!" We were hoping and praying reverently in between shouting to let sir Jeff know that we are not leaving him behind. No. Suddenly, the thick fog rose from the forest so quickly that it covered the whole view in zero visibility for only some minutes. But the weird thing was, it only covered the part where Sir Jeff fell. The rest of the view and the back were all clear. And then a rainbow appeared. Not in the usual after-the-rain rainbow arc, but instead it was a perfect circle rainbow. I know that was nothing exceptional or mystical or miraculous since it was all a natural phenomenon. As you can see in the picture, in front of me is the foggy part while the back is totally lit and sunny. But still for us, it kind of let us continue to hope and pray and that we would accept any kind of sign from the heavens. The local Forest Guards came together with the PNP, BFP and ASAR for the rescue ops. The confirmation of death came shortly from the policeman who checked the body. The story from one of the mountaineer who have witnessed the incident may inspire others people. Its not for us to stop dreaming when something unfortunate happens but its how we deal with it. 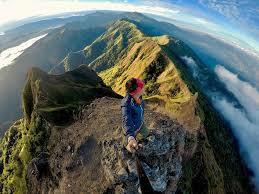 Life is short, but still mountaineering is life!